NextRoman mosaic from Antiochia, House of the Evil Eye. Pompeii and Herculaneum are Roman cities from late antiquity that don’t need any introduction. We have all heard the story how they were obliterated during the catastrophic eruption of the volcano Mount Vesuvius on 24th August 79 CE. I wrote about it here a few years ago on a colleague’s website. In short, they say Pompeii was covered by a thick layer of pumice and ash up to five metres deep, while its closest neighbour Herculaneum was buried by mud-lava up to fifteen to twenty metres deep. It wouldn’t be until 1748 before Pompeii and to a lesser extent Herculaneum were accidentally rediscovered. What they found beneath the ash and tufa was amazing! Most remarkably, buildings, objects and victims were preserved intact with very little damage. Interestingly, both cities tell us more about Roman life in the first century than any other great Roman city or town. 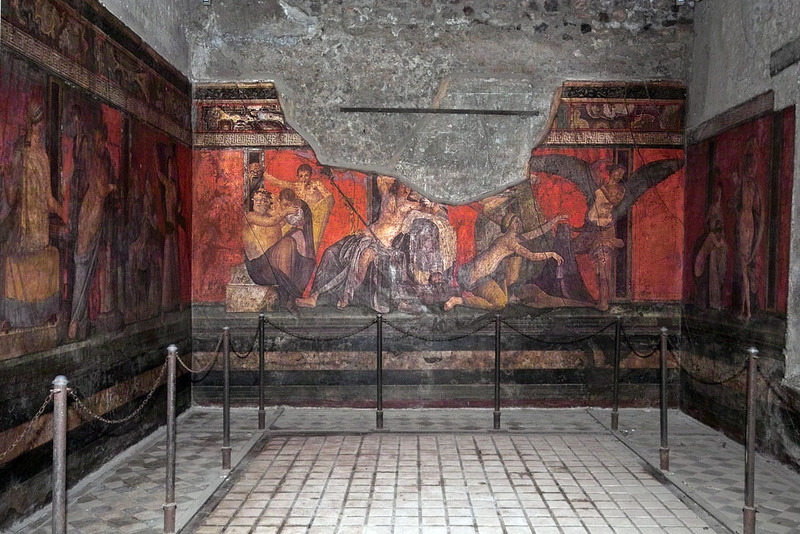 For me one of the best reasons to want to visit Pompeii and Herculaneum is to see the wonderful wall paintings and floor mosaics of the period that adorned the spacious and well-made homes and villas of the rich and famous. That said, it is important to note that most of the original artworks have been relocated nowadays to the National Archeological Museum in Naples to protect them from the elements and vandalism. Anyway, I cannot hope to illustrate or talk about all the wonderful artwork that has survived, but I will attempt to highlight some of the more interesting paintings and mosaics that I have uncovered over the years through my reading. Without further ado, this is part one (of two) of this series. Wall painting of the amphitheatre of Pompeii, National Archeological Museum, Naples, circa 59 CE. 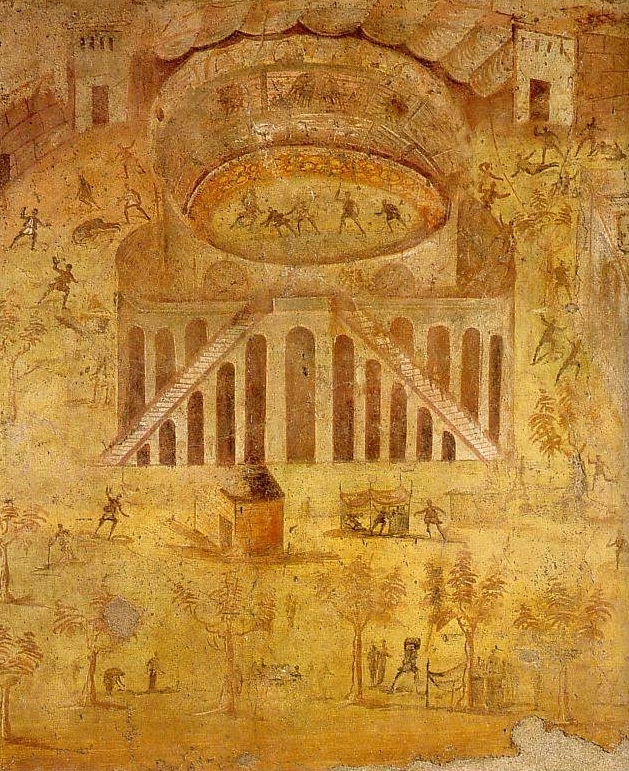 Sports and games in the form of gladiatorial combat was almost a prerequisite to any self-respecting city including a provisional city such as Pompeii. So began an obsession to build one of the first stone amphitheatres during the reign of Sulla. It is believed that the impressive structure was initially built for Sulla’s 5,000 veterans and their families. An inscription on the amphitheatre dates its completion around about 70 BC that even predates the Colosseum in Rome by a little over a hundred years. Typical of amphitheatres that sprung up in the early days of permanent stone structures, Pompeii’s arenas elevation allowed for the best possible views for everyone that attended games or contests. Beneath its impressive exterior also lay a labyrinth of tunnels and rooms, similar to the Colosseum, though on a smaller scale. These substructures beneath the tiers likely housed gladiators before they emerged out into the arena. With an estimated capacity of about twenty thousand spectators, Pompeii often put on a show like no other. It was able to successfully promote its gladiatorial games to Romans from all neighbouring areas and towns like Nuceria. There is an interesting story that involves both the citizens of both Pompeii and Nuceria, in which a massive riot broke out involving an argument over a gladiator. The event was recorded for prosperity in this wall painting here above. It’s quality isn’t that great. (Interestingly, the amphitheatre is almost true to life with some exaggeration.) We can only imagine the details behind what really started the riot, like someone disliking the belt buckle of a particular gladiator? Nonetheless Roman authorities were absolutely appalled by their riotous behaviour and banned Pompeii from holding further gladiatorial games for ten years. A rehearsal for a satire or Choregos and actors mosaic, National Archeological Museum, Naples, c.62-79 CE. Looking at the previous wall painting of the amphitheatre of Pompeii, it is so easy to forget Rome wasn’t just obsessed with spectacular gladiator games. Romans also enjoyed all forms of entertainment including theatre performances, tragedies, comedies and satires. That is why the tablinum floor mosaic in the House of the Tragic Poet, featuring a rehearsal scene for a theatre performance is so interesting. It serves as a reminder how much the Pompeiians loved their theatres. Interestingly, Pompeii had two stone theatres almost two decades before Rome had its first permanent stone theatre. The colourful mosaic shows a bearded choir conductor sitting, surrounded by actors and a musician playing a double flute, while behind the conductor stands a wardrobe helper, dressing another actor in preparation for the coming performance. Three tragic theatre masks add to the intrigue of the scene. 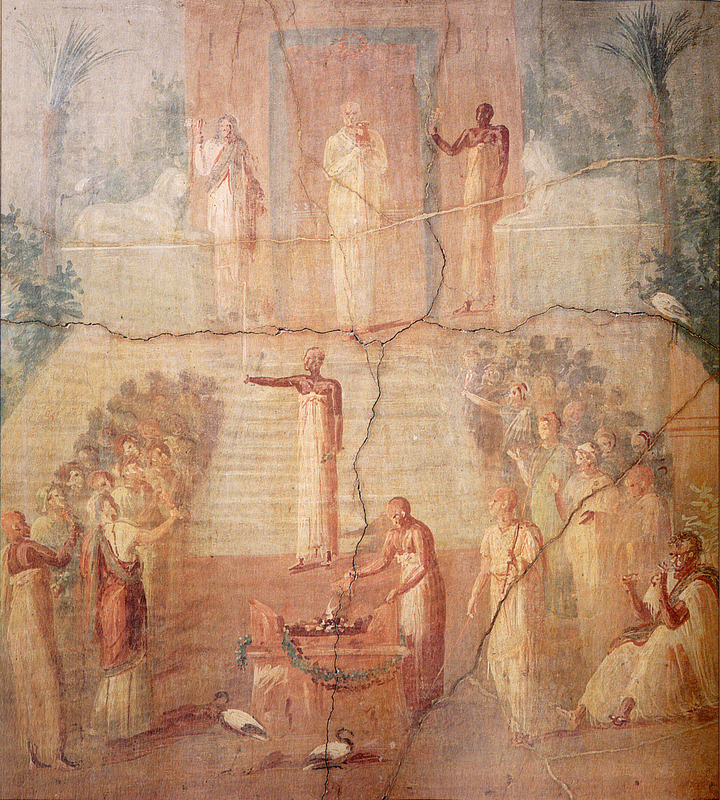 Fresco of the mystery ritual, Villa of the Mysteries, Pompeii, Italy. In general, red was one of the most popular colours used by Romans in wall painting. It was no different in Pompeii, where evidence of it can still be found on exteriors of buildings and inside many of the once extravagant homes of the rich. One of the most spectacular examples of the use of red is found on the inner walls of the Villa of the Mysteries. An almost life–size fresco set against a vivid red background along three different walls, shows wonderful portraits of various individuals, ranging from noble Roman women and priestess to nymph’s and winged female figures. (See also the header image of the Startled Woman from the same fresco. She is featured on the north wall seemingly engaged in a dance move, holding her purple veil above her head.) Though nobody really knows what the fresco represents, art historians best guess is that it probably depicted some sort of cult or religious rite. The presence of Dionysus and the overwhelming number of female figures associated with him, helps support this interpretation. Fresco of the rite of the goddess Isis, Herculaneum, Italy. Isis was an Egyptian goddess whose worship spread all over the Mediterranean. It arrived on Pompeii’s doorstep at the end of the 2nd century B.C and archeological evidence suggests that the cult of Isis (and of Dionysus) reached its height in popularity probably in Pompeii and Herculaneum’s final years. When Pompeii’s origin Temple of Isis was destroyed in an earthquake in 62 AD, a new one was fully restored in its place, highlighting the importance the cult of Isis held over the town. We are fortunate to have what appears to be a ceremony or ritual in this surviving fresco from Herculaneum (above). The presence of a number of priests, one holding a vessel, others holding musical Egyptian instruments known as sistrums and a horned altar tended by a priest, show us how Romans might have took part in worshipping the goddess Isis. Many Egyptian elements such as sphinx’s, palm trees and ibis birds, also seem to add to the exotic nature of this mystery cult. Fresco of a late Roman Republican private banquet, Herculaneum, Italy, c.50 BC. 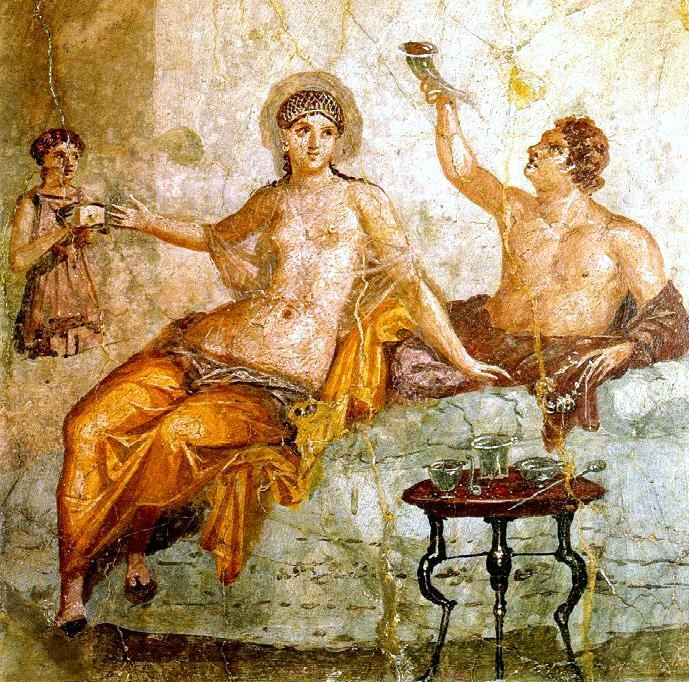 Is this fresco a reminder what life was like in Herculaneum before it was devastated by the eruption of Mount Vesuvius? A woman wearing a see-through silk gown and a man (possibly her husband) raising a rhyton drinking vessels during a private dinner, tells me that life for the rich must have been one big party. It is not to say that the lower Roman social classes didn’t try to live life to the fullest. They probably did. Surely, every occasion was a reason to celebrate life, whether it was dinning out in restaurants, taking long soaks in the many public baths or sitting in the stands of the theatre and gladiatorial games. If I am correct, this fresco shows us a rare glimpse into the luxurious private life of the wealthy during a banquet or a small-scale dinner party. My understanding of Roman daily life is that towards the end of the day, probably after their long baths, Romans of all classes, especially the rich headed home for the biggest meal of their day known as cena. The cena (dinner) was something that was on occasions celebrated with family and friends. It usually consisted of several courses and plentiful amounts of diluted wine. Dinning Roman style was, of course, often done in a reclining position on a triclinia (couches with cushions) and set around a table, where waiters (household slaves) served hosts and guests plenty of food and drink. In short, private dinners or banquets were a great way to socialise and often after dinning, a drinking game or two and entertainment might have followed. Detail of Triton, the son of Neptune, central baths, Herculaneum, Italy. Some of the most popular subjects in mosaic artwork in ancient Rome were mythological scenes, daily life, the circus and gladiatorial games, the four seasons and the sea. (Romans were particularly obsessed by any subject matter related to Greek art and Greek imagery.) Most rich and well respected Romans decorated their villas with magnificent mosaics. But intricately decorated works of art were also accessible to the public in such places as plazas, temples and baths. In the women’s central baths in Herculaneum is a wonderful mosaic featuring Triton, the son of Neptune. It is surprisingly intact, showcasing Triton in all his glory. It seems fitting that he sits at the bottom of the bath with his curling sea serpent tail (legs), surrounded by (though not shown here) leaping dolphins, an octopus and other sea creatures. 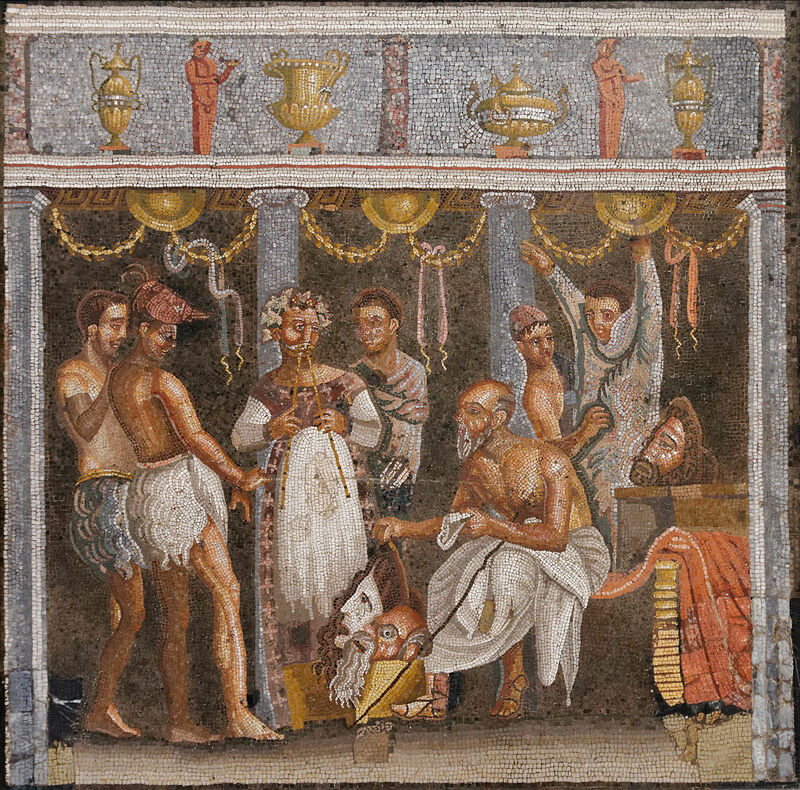 Interestingly, the choice of black and white mosaic stones (tesserae) in this bathhouse was typical of most marine motifs used in Roman baths, especially in Italy. Dog floor mosaic, House of Orpheus, Pompeii, Italy. The Cave Canem dog mosaic, set in the entrance of the House of the Poet, is arguably the most famous of all the dog mosaics in Pompeii. The striking image of the snarling dog with its vicious teeth for all to see is quite confronting. The mosaics warning “Beware of the dog” is appropriately highlighted to remind visitors that they were setting foot into a guarded home. There is, of course, another Pompeii dog mosaic, simple in its brilliance and detail, that is just as impressive and also somewhat of a favourite of mine. Skillfully laid in the entrance hall of the House of Orpheus, it too conveys a similar warning to all visitors. 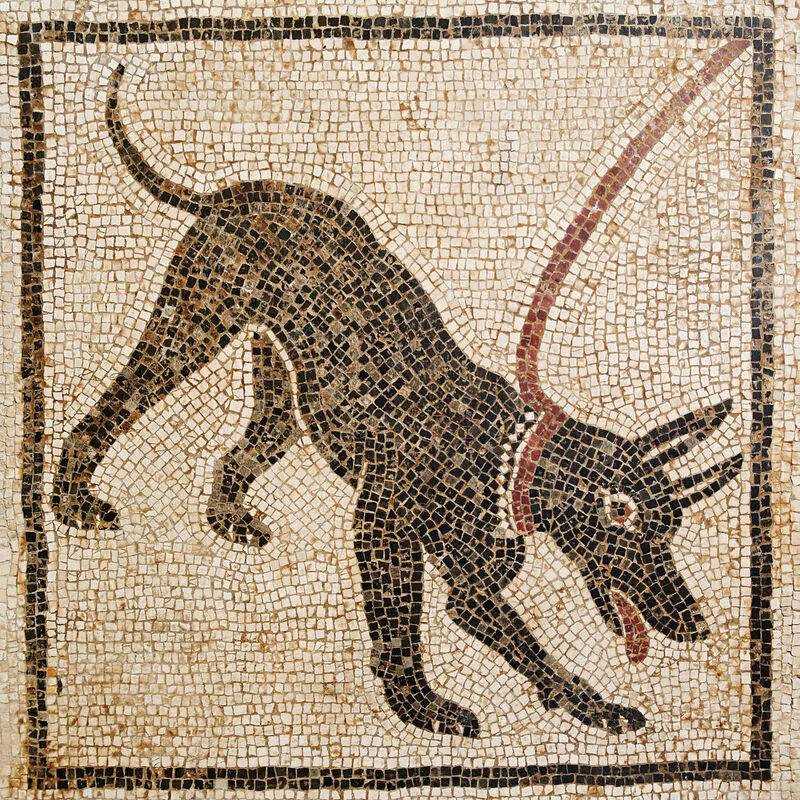 Though, the dog in this mosaic hardly seems aggressive in appearance, wagging its tail and looking like it would likely lick you to death than tear you apart. 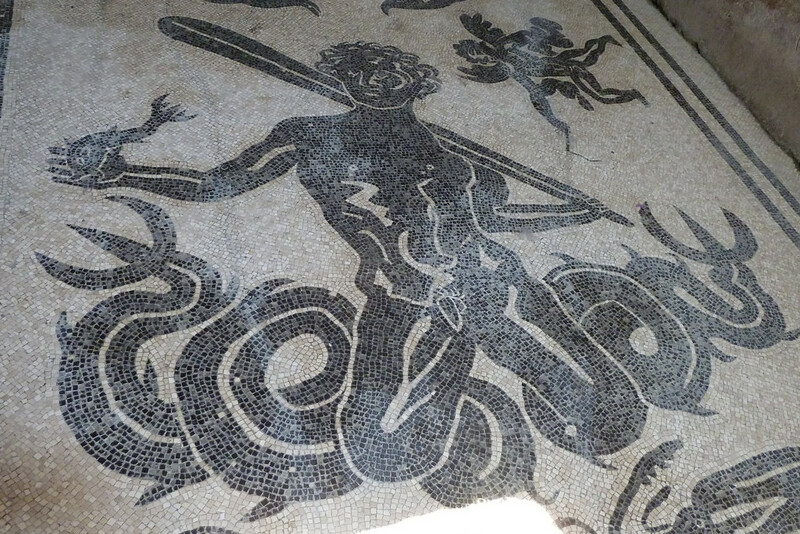 Nonetheless, mosaics such as this one were very popular in Pompeian houses and throughout the empire at that time. Check back soon for Part 2 of this brief guide to the artwork of Pompeii and Herculaneum. Photo Credit: All images used are in the public domain, except the image showing three walls of the Roman fresco in the triclinium (dinning room) of the Villa of the Mysteries, which is used Creative Commons Attribution-ShareAlike 2.0 license. The image of the Trition mosaic is by flickr user Dave & Margie Hill and is used under the Creative Commons Attribution-ShareAlike 2.0 license. I love how you explain the backstory of each piece. Speaking for myself, I can look at art and appreciate it, appreciate the culture but sometimes it does not take life. Maybe is the mundane routine of everyday life that prevents me from stopping to truly observe…Nonetheless, I appreciate reading your post. This is a great post! You did a wonderful job on my favorite place! I’m looking forward to Part 2! Indie pop, folk and opera, all in a days work for Kate Miller-Heidke.